Hey everyone! I’m sorry for the late posting today and my absence from the interwebs from noon Friday on. 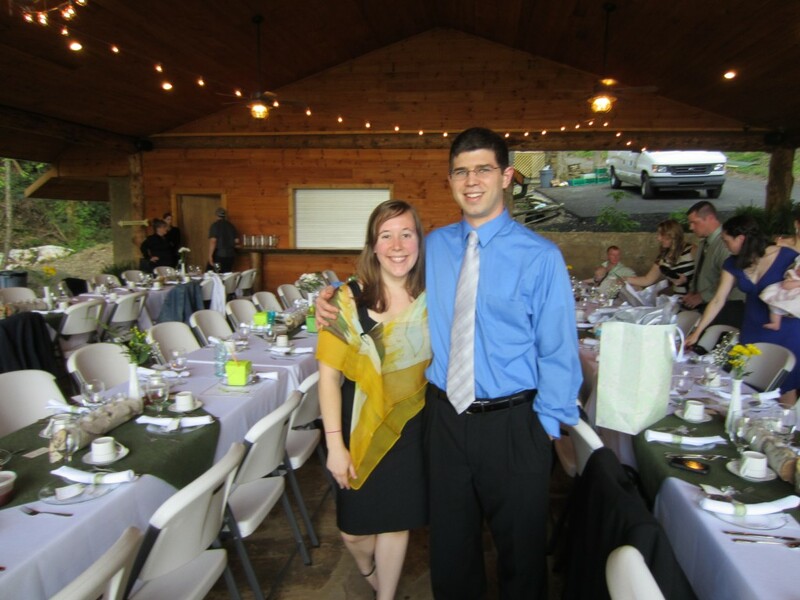 Kyle and I went to Tennessee this weekend for a wedding! It was a wonderful celebration and we got a lot of quality time alone together as well as with our college friends. I was planning to keep up with blogging stuff as usual in the early mornings and late evenings, but it turned out that our hotel didn’t provide internet access in our rooms, only in the lobby, which closed at 11:00 PM. So I’m sorry that I wasn’t able to comment and respond to comments as usual. Thanks for still visiting my blog through that period! David at Money Under 30 posted a list of 10 common misconceptions about money. Most of these are rather subtle and many people might go through phases where they believe these even after starting to get their finances in order. Kraig at Young Cheap Living wrote a truly great, comprehensive post of personal finances suggestions (I might even say mandates!) for young adults. I wish everyone just starting out would read this post! Well Heeled Blog put up a detailed version of her wedding budget. She’s planning a lovely intimate ceremony and reception and have done an awesome job keeping their expenses under $7,000! When Life Gives You Lemons and Well Heeled Blog both wrote posts on the same day on groups of people for whom No Spend Days would and would not work. Daisy discusses daily impulse spenders vs. people who would spend anyway and Well Heeled discusses abstainers vs. moderators. I am totally a person who would spend anyway and an abstainer, therefore I have no use for no spend challenges and trying to “cut down” on things. Jason at Work Save Live posed a great question: should you sell your wedding rings to get out of debt? Suba at Wealth Informatics compiled an awesome comprehensive post on how self-employed people can obtain health insurance, including those with preexisting conditions. Did you know you can get it through alumni associations and Costco? Check out her post! Derek at Life and My Finances published my article Short-Term Savings Accounts for Irregular Expenses. This was my first guest post so thanks Derek! This post has a more personally detailed sister article that I wrote a while ago, although a few things have changed for our accounts since then (mostly, going to one car). Financial Tethers to Our Families of Origin was mentioned by Kari @ Small Budget Big Dreams. Five Money-Saving Moves from Our Wedding was mentioned by John @ Married with Debt. Tax Time! What Are Your Rates? was mentioned by Life in Transition. Earned Income: The Bane of the Graduate Student’s Roth IRA was mentioned by Hedy @ Penny for My Thoughts. Bog of Debt gave a shout-out to EPF in her Friday Link Love. Frugal Portland congratulated us on getting our Alexa Ranking below 200,000 in her fun things post. Dental Care without Insurance was featured in the Financial Carnival for Young Adults 7th Edition and the Festival of Frugality #331. How Does Your Salary Compare to the Living Wage was featured in the Carnival of Personal Finance #356. You all gave me such wonderful compliments and support on my post about saving money on our wedding – thank you! I really wasn’t expecting all of that. My favorite comment from the week was Renee’s on that post. Not only did she list several great cost-saving measures from her own wedding, but it was clear from her comment that she and her husband clarified their priorities for their wedding early on and followed through on them! “The most important thing to me was to support local and/or independent artists/shops/farms/etc the best I could.” I think this is the most vital and most challenging thing about wedding planning (and a lot of the rest of life!) – not to lose sight of your priorities in the hundreds of tiny silly decisions that have to be made. 10 Responses to "Weekly Update 11"
That’s pretty cool […] is at the top of the list! That 30-year ROI looks pretty saweet! We had access to email and such through Kyle’s smartphone, but I didn’t want to respond to comments on the phone as it would have taken so much more time than on a computer. But I had to spend a LOT of time last night when we got home to catch up on blog stuff though – finishing this post, writing Monday’s, approving and responding to comments, and getting through my Reader! I don’t want to let it go without maintenance for more than a day again. Tricky because we’re going out of town again in two weeks. We’ll have internet access at night but we will also be super busy. When I’m out of town, I use the WordPress app on my phone to approve comments and check stats. I can reply to comments by email on my phone, which I do sometimes if I want to write short replies, but otherwise it gets annoying. So I just star the emails for the comments that I want to respond to. As for Reader, I have an app on my phone for that too. I usually try to run through that once a day and mark as read everything that I’m not going to comment on, so that when I do get back to a computer, that part has already been filtered. Thanks for the suggestions! I’ll ask Kyle if he wants to install that WordPress app on his phone. I felt really bad when I got back Sunday night and had several new commenters who I hadn’t approved all weekend. I don’t want to mess with his Reader though since he uses it on a daily basis. I think I’ll get my own smartphone in the near future so I can be more mobile with the blog upkeep. Young Professional Finances recently posted..What’s In A Name? Surprising to me, too! I know a lot of “Kyle”s though so I already have to expend some effort to keep them straight. My lab/officemate’s name is Kyle so whenever my advisor mentions my husband I think he’s talking about my labmate. Also, I once gchatted another Kyle “goodnight, I love you” etc. for several messages before I realized my mistake. I was so embarrassed! FUN! What a cute picture. I love weddings — don’t apologize for not being accessible 24/7! Yes, very good point. I think I was more bothered by the fact that I had expected to be able to keep up and then found I wasn’t able to.